The larger and longer an air horn is, the louder and deeper it is capable of being when sounded. 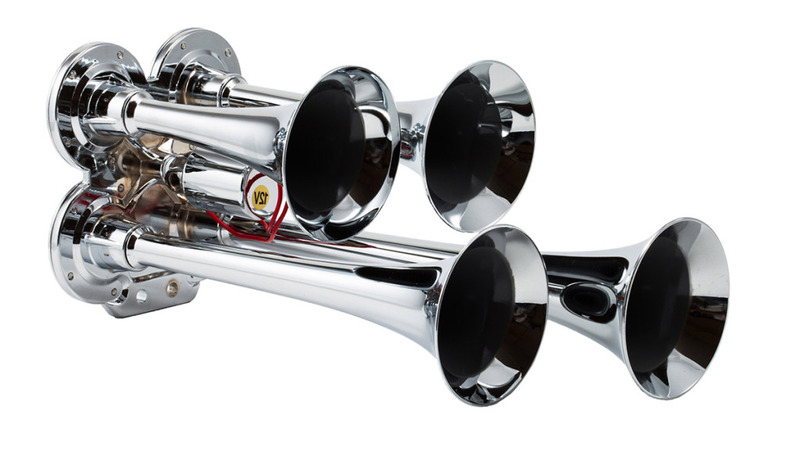 Additionally, the higher the pressure used to honk the horn – the louder the overall sound will be. Because of this, the Roof Mount Horns will be very loud and very deep-sounding, but will only produce a single note. Multiple trumpets of varying lengths produce a combined tone, that some find more pleasing. Depending on the type of vehicle your horn will be installed on – always select the largest horn you can fit onto your vehicle. Direct Drive Horns will not be as loud as our air tank-driven Compact Air Horns and the Compact Air Horns cannot rival our Train Horns for the incredible sound they are able to produce. Train Horns require an air source that includes an air compressor, and air tank ranging from 1.5 to 5 gallons in volume. Train Horns are generally triple trumpet horns, that are larger with heavy duty diaphragms and solenoid valve to create massive sound. 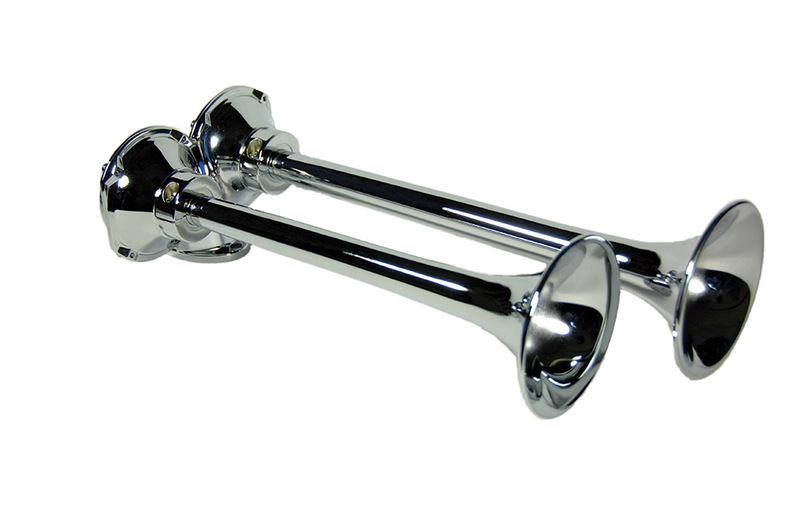 Sound varies between horn models, but all are designed to mimic the true sound of a train in tone and maximum volume. Air flow upgrade kits are available for our largest horns, that maximize air flow and make them even louder! Roof Mount Horns require an air source that includes an air compressor, and an air tank ranging from 1.5 to 5 gallons in volume. Roof Mount Horns range in overall length from 15” to 25” and are available as smaller dual horn assembly, or as single larger horns for big rig applications. Roof Mount Horn Models 401 & 411 require the use of P/N 330 for installation, and also require either a solenoid valve or one of our manual valves for installation. Model 412 will only require a manual valve or solenoid valve for operation. Direct Drive Horns are a great alternative to a non-functioning factory horn. 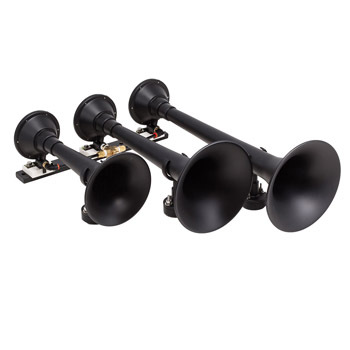 All Direct Drive Horns come as complete kits that are easy to install with a dedicated direct-drive, instant-on mini air compressor, air horn, air line, mounting hardware, relay and instructions.